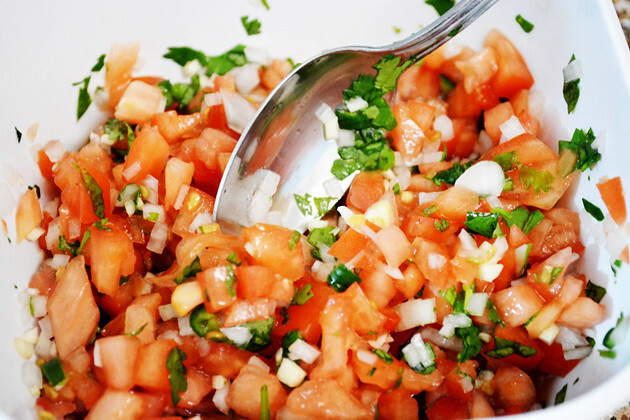 The preparation time is only 10 minutes, with less efforts this easy, savory salsa will be ready. We can use this salsa dip for tortilla chips, lays or Nacho chips. When I prepared this salsa, we completed party pack tortilla chips in 2 days . All the ingredients in the salsa are only onion, tomato and garlic and those are good for our health except the chips. If the chips is oven baked then there is no disadvantage in this salsa... 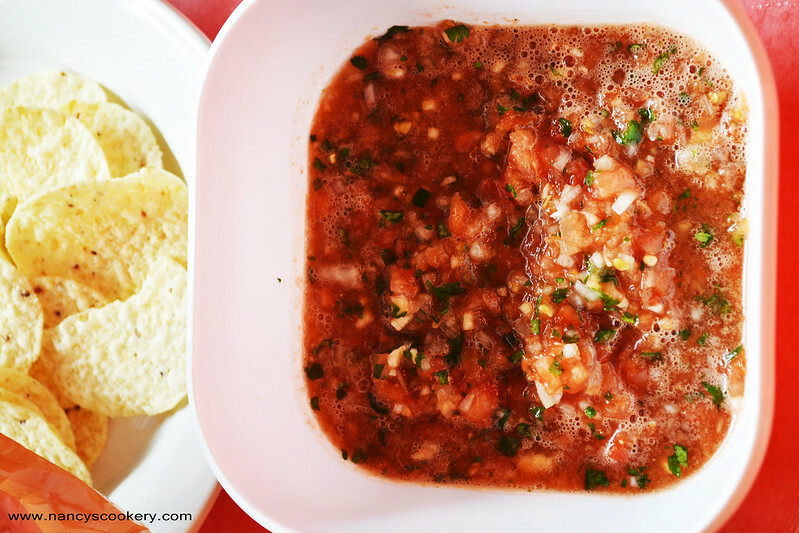 When hubby first took me to mexican restaurant, they served this salsa with tortilla chips. When I tasted I called this salsa as INdian Rasam... . If you add tamarind juice to this mixture and boil it is our "Indian Rasam". 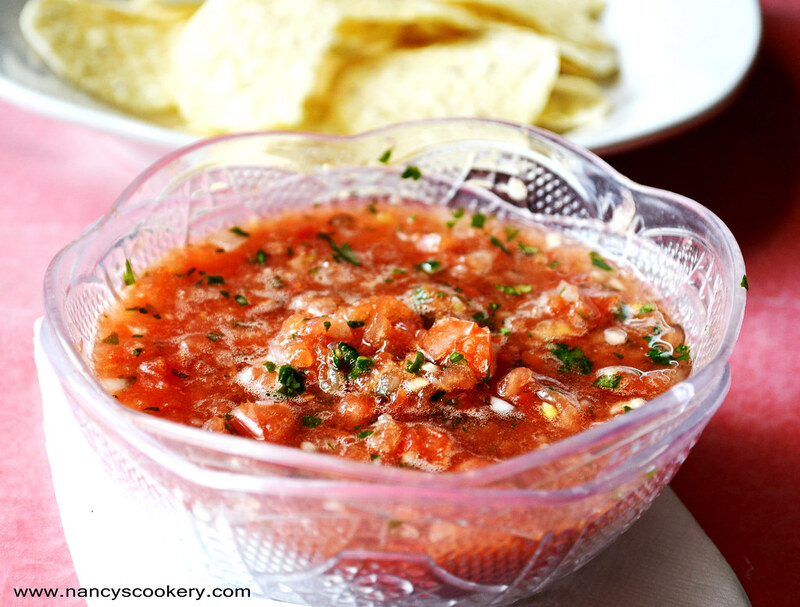 Just kidding, the salsa tastes great and spicy and I am sure it will become one of your favorite evening snacks combination- salsa&chips.. Now enjoy the salsa dip . 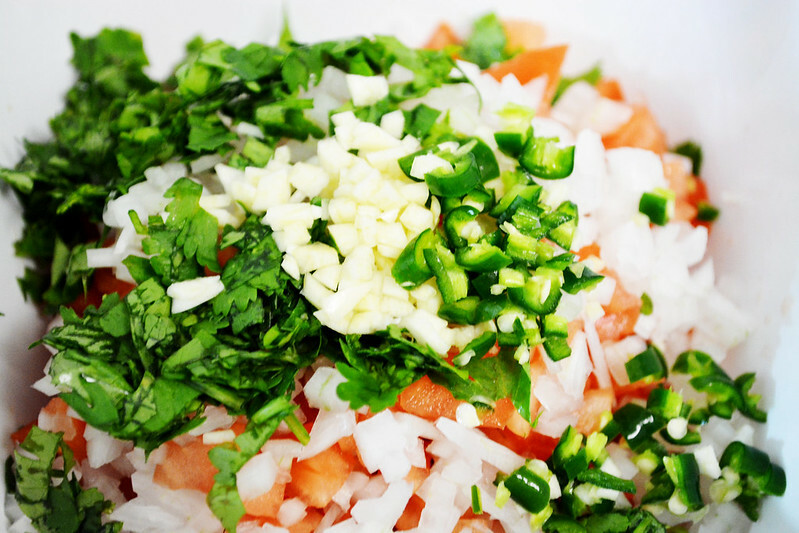 Chop all the ingredients(Tomato, Onion, Garlic, Green Chilly/Jalapeno, Cilantro). Mix the chopped ingredients with lemon juice and salt in a bowl. Add them all in food processor/ mixer and pulse it for 2 seconds, then scrap it from the sides and bottom. Then pulse again for 2 seconds and mix it from the bottom. 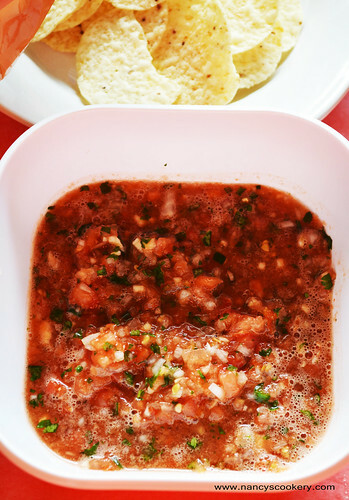 Do this 4 to 5 times until the salsa is juicy and not fully smashed with bite sized fewer particles. This is the consistency. Then pour it in bowl and serve it with Tortilla chips and enjoy the spicy salsa dip. 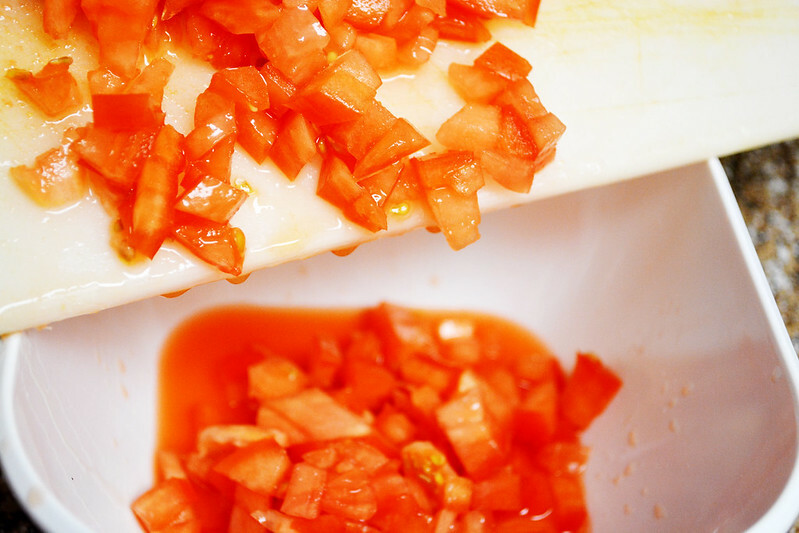 Chop the tomatoes into small cubes. 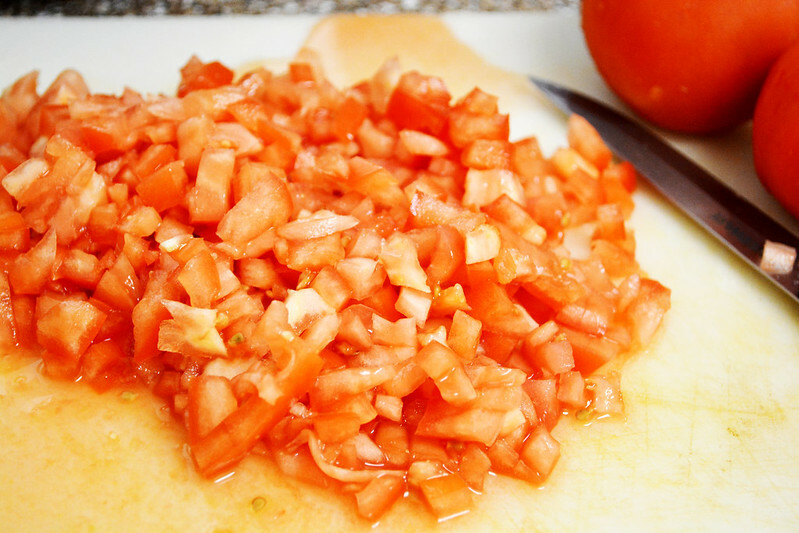 Pour the chopped tomatoes into medium sized bowl so that initially we can mix all ingredients in it. 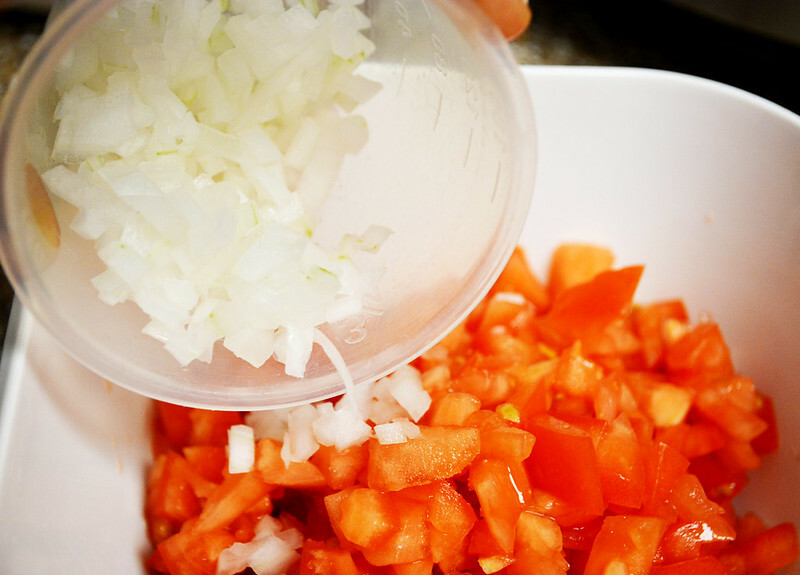 Then chop the onion into small cubes like tomato then add it to the bowl. 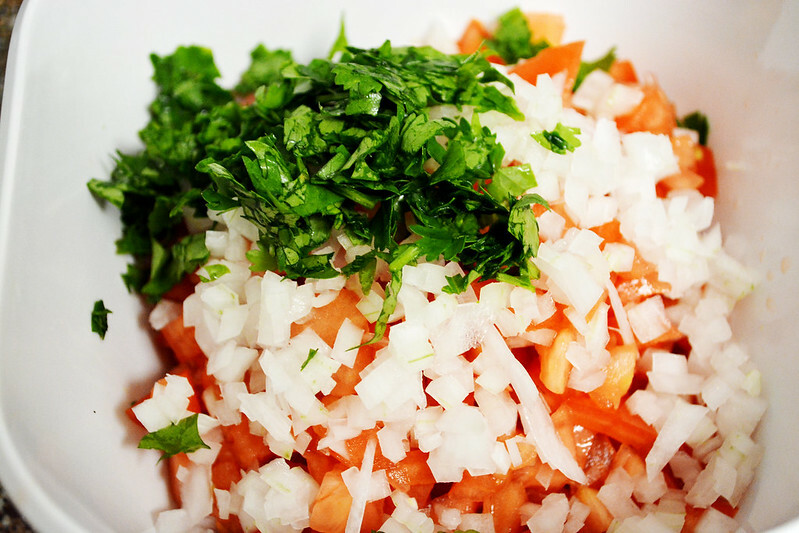 Now chop the cilantro finely and add that also to the bowl. 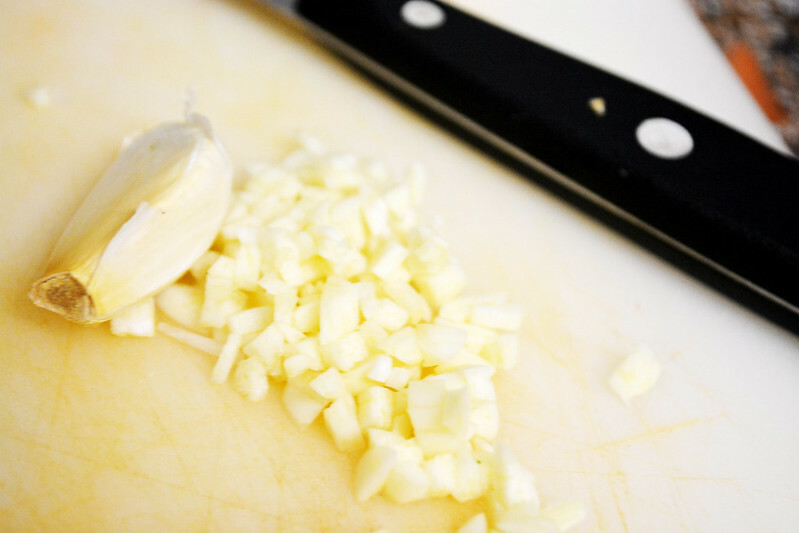 Chop the garlic into fine bits. 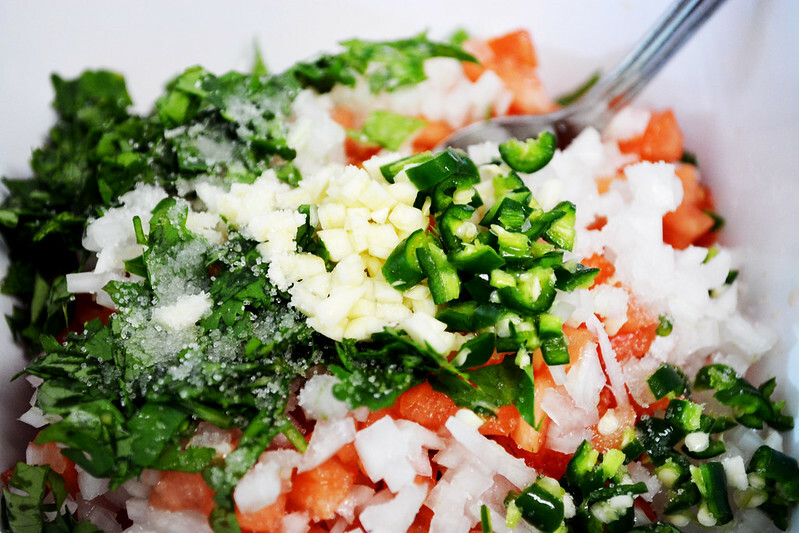 Add the chopped garlic to the bowl along with chopped green chilly/Jalapeno. Now squeeze 1 tbsp. Lemon juice without seeds. 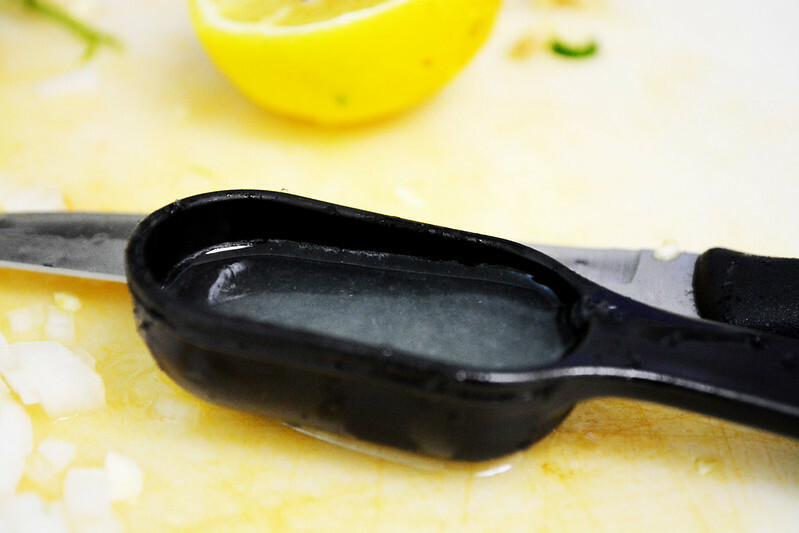 Add the squeezed lemon juice and salt to the salsa bowl. Mix everything well so that it combines together. 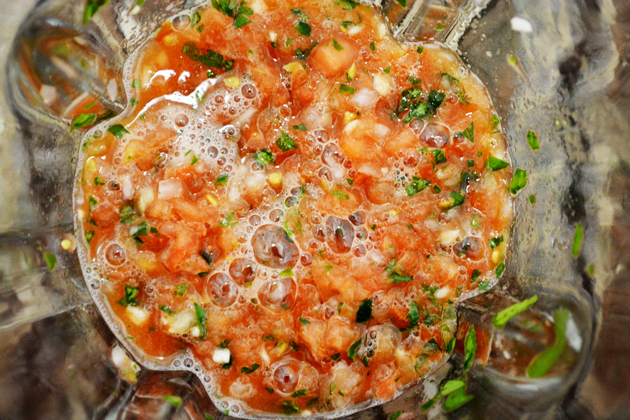 Now at this stage the salsa is not juicy, so add the salsa in food processor/ mixer. Pulse it for 2 seconds, then scrap the sides, mix it from the bottom, then pulse it for 2 seconds, Do this until the salsa is juicy with some bite sized particles. You may have to pulse it for 4 to 5 times depending on the food processor/mixer. Now pour the salsa into the same bowl. Serve it with Tortillas or any kind of chips(Lays, Nachos...), It tastes super hot and savory. If you want to reduce spiciness, reduce the chilly accordingly. Select juicy and well ripened tomatoes. Adjust green chilly/Jalapeno according to the spice level you need. 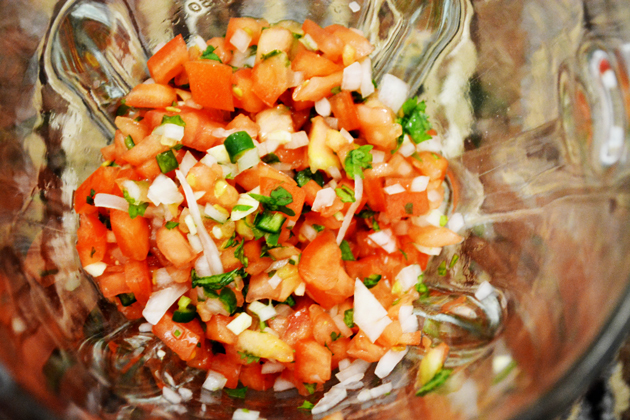 Do not pulse the salsa to watery and be careful while pulsing the salsa in mixer/food processor.